#29967 restored, August 21, 2004. #29967 at North Freedom, April 2000. #29967 at Stevens Point, 1971. During the early part of this century, the nation’s large meat processing facilities were located in major metropolitan areas such as Chicago or Kansas City. The railroads transported livestock from the ranges to the meat processing centers of the metropolitan areas. 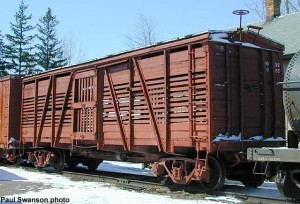 To provide for the safe delivery of the livestock, railroads used specifically designed equipment. The rules that governed the movements of livestock on the hoof required resting, feeding, and watering of the animals at specific intervals and as a result of this, stock cars moved primarily as whole trains of stock cars or in local trains with no specific time table. Time table or manifest freight trains could not make the required stops for the animals and still maintain the schedule. 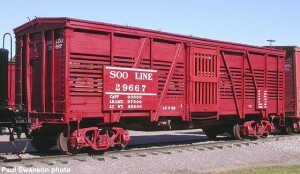 Soo Line stock car #29667 was built in a series of 400 cars, numbered from 29600 through 29999, by the Haskell & Barker Car Co., specifically to haul livestock. It was delivered to the Soo Line in July 1921. 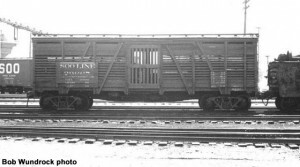 This 40 ton capacity, 40 foot long car was constructed to AAR Classification “SM” designation, meaning that it is of single deck design with open slatted side construction for the transportation of livestock on the hoof. In revenue service, Soo Line #29667 moved many loads of cattle from the North Dakota and Minnesota farm communities to the Chicago markets. 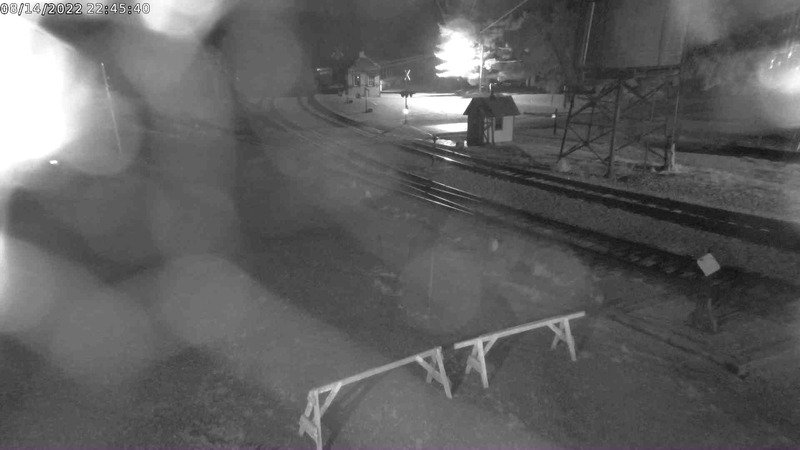 The car was eventually removed from revenue service at an unknown date, and assigned to work service for transporting new ties needed for track repairs. There is no evidence that the Soo Line ever renumbered it into its work service series. 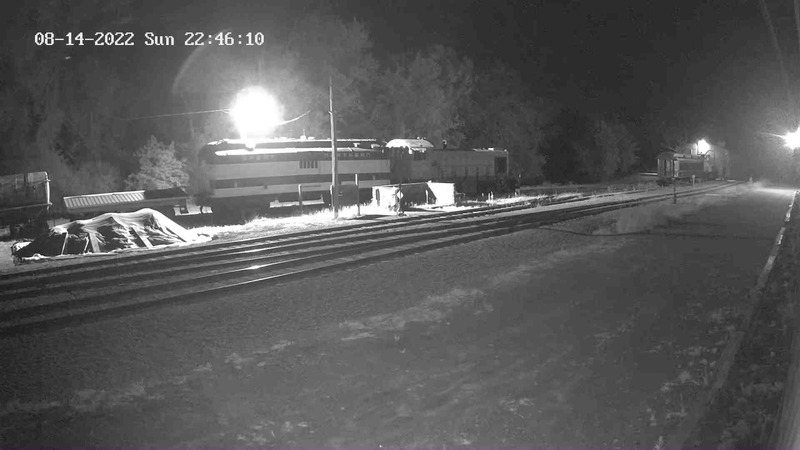 Soo Line donated the car to Mid-Continent in December 1971. It was restored in 1987, lettered for the style in use on the Soo Line during the later part of the 1930’s. In 2004, after years of display outdoors, the car’s paint job was renewed again for the Soo Line Historical & Technical Society’s convention, held at North Freedom, August 21, 2004. The Haskell & Barker Car Co. was incorporated in 1871 at Michigan City, Indiana. The plant expanded over the years to become at one time the largest single car building plant in the United States. In 1922 the Haskell & Barker Co. was sold to the Pullman Car Co. and became known as Pullman’s Michigan City plant. An interesting point of the sale was that Mr. Carry, the then-current president of the Haskell & Barker Co., became president of the Pullman Car Co. when the sale was consummated.